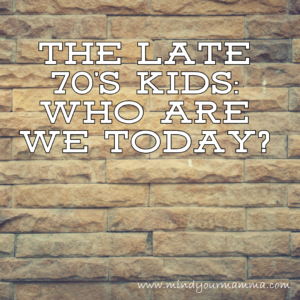 The late 70's kids: who are we today? Technically, by the time I was born, I missed the 70’s by a couple of months, but I mainly grew up with, and I’m surrounded by people (family, close friends, colleagues etc.) who were born in the late 70’s – we are the ‘late 70’s kids’. And I’m generally not one for labels and generalisations, but I’ve had a few occasions lately of interacting with different people that had made me think that we may all be from different backgrounds, have different stories, even live in different countries and cultures sometimes, but there are quite a few things that we (the late 70’s kids) seem to all have in common. So here’s my broad view as to who we have become. We are the ones who are either approaching the big Four Zero or have just about reached or passed this ‘milestone’ and are starting to become a bit more conscious about what we eat and the lifestyle choices we make. We are the ones with hectic lives, always rushing from one thing to the next, feeling we don’t have enough hours in the day to do everything. The ones who perhaps are just trying to do too much, due to the enormous amount of pressure we put ourselves under – don’t we just need to ‘do it all’ and be perfect at everything? Work, be perfect partners, perfect parents, be on top of everything at home and in life? …who often struggle to prioritise (or need reminding about prioritising) self-care (physical and emotional) and our relationships with our partners. We are the ones who really start to feel that time is flying by, and the older we seem to get, the quicker the months and years seem to disappear behind us. Mostly, we are parents – of young babies, of babies in heaven, toddlers, pre-schoolers, school-age children and some of us even teenagers. And we are the ones who say that parenting is the most rewarding ‘job’ there is, but at the same time we call it hard and exhausting. …who are overwhelmed with information and different opinions – from pregnancy all the way to the teenage years, all we hear is talk about parenting ‘styles’ and ‘methods’, to the point that we probably spend years trying to work out what the ‘right’ or ‘best’ thing to do for our families is. Because of where we live and our families and friends live, we are the ones who end up relying on the virtual ‘tribe’ of the internet more than we can rely on an actual tribe of supportive family and friends. And because of that, we are the ones who doubt ourselves and our abilities all the time – whether we work full time, part-time, work at home, stay at home etc. we have become self-critical, judgemental and insecure and forgotten what it’s like to be kind to ourselves (refer back to point #3 and the enormous amount of pressure we put ourselves under). Because at the end of the day there’s ‘real’ life, and there’s the life we choose to project or are exposed to on social media, and don’t we often forget that people only show what they want to? …who worry as to whether we’re doing a good enough job at raising confident, content and caring children. And wonder whether we’re still able to teach our children ‘good’ values. Because a little bit of empathy and gratitude would still go a long way, even in this crazy world. We are the ones who strive to protect our children from any dangers and any sort of disappointment in life. We want to give them not just what they need but, where we can, what they want. And we still worry that they won’t ‘love us’ or look after us when we’re older. The ones who are often baffled by the ‘strong-willed’ children we’re raising. Did our parents have to deal with twonagers and threenagers and the drama of toast cut in triangles when they wanted squares? And we’re often wondering whether we’re dealing with these behaviours in the right way. …who remember a (simpler?) time when your friends had to phone you on your parents’ landline; a time with no mobile phones and when making an international call to the other side of the world was extortionately expensive. But now, we are the ones who have become inseparable from (and fully reliant on) our smartphones. We are the ones who often replace face-to-face interactions with video calls and instant messaging. And we realise that our children won’t know anything about the world we grew up in. They will take this ‘evolution’ for granted. What kind of relationships will they have with their friends and family by the time they grow up? We are the ones who are terrified by the digital world our children are growing up in. And we worry about whether we have the tools and the foresight to fully protect them from its dangers. We are the ones who are scared about the future. For ourselves and our children and worry about the political, economic and environmental landscape we currently live in. What will it mean for our children growing up? What will it look like for them? It’s scary stuff. But most of all, we are the ones who are really trying to be the best we can. We try to improve, change and step up. This is who we are today. We are a lot of things, and a lot more than we give ourselves credit for. So, when you see us, please give us a big pat on the back, because we’re doing alright. Next Post A review of the Calm app – download it now! Nice article Sara, I can relate completely with everything you say. As a dad I keep thinking not enough time but I need to be able to do a lot for the kids. I want the best for them. I want my wife to be happy and stressfree. She juggles a million and one things makin her a superwoman and yet it feels like there’s never enough hour in a day. Perhaps if we had a couple of hours added in to the 24hrs maybe things will be better? It is what it is…thanks for sharing. Dang! Right on! I can relate to just about every single one of these. Great post! Phew! I’m glad people don’t think: “What?!? That’s not me at all!! !” Ha ha. And I’m glad I’m not the only one to be worried! This post definitely resonates with me. The world we lived in is a 1000 miles away from the one that our children are growing up in, it’s scary. This is an interesting look at the concerns of parents who are bringing up young children at this age. I was only barely born in the 70s – late 79 for me! But I can relate to a lot of this. I think our generation is living in a unique time because technology has moved on incredibly fast in our 30-40 odd years. The internet has completely revolutionised the way people interact with the world. This has both good (yay for my blogging tribe) and bad (smartphone obsession) effects. Thanks so much for linking up at #KCACOLS. Hope you come back again next Sunday. The Mum Reviews recently posted…Should I lie to my children about Father Christmas? Thank you Nicole – the smartphone obsession (to borrow your phrase) is something I’ve been wanting to write about too! I’m truly scared about what it will all mean for our children growing up. I’m sure there will be wonderful things that they can use when they’re parents themselves, but the teenage years in relation to technology (amongst other things!!!) really scare me! They certainly have! Glad you can relate Jeremy!